Find a luxury hotel in Maldives from the Hotique Hip Hotels Guide. Hotique is an independent guide, featuring luxury 5 star design hotels, hip hotels and unique boutique hotels including hip hotels in Maldives. View our featured hotels in Maldives below or search for a boutique hotel in Maldives. Welcome to Hotique's selection of luxury hotels in the Maldives - including private water villas, and beach villas. The Maldives are ideal destination for a honeymoon or a romantic break and the white sandy beaches mixed with palm trees are picture perfect. From small luxury hotels to boutique hotel resorts, choose your perfect pad from our hand-picked selection of the best luxury hotels in Maldives. From the stylish upmarket W Maldives and to the family friendly Conrad or Coco Palm, choose the Hotel that suits your style. 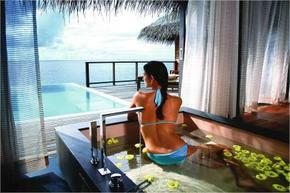 The Maldives is perfect for private honeymoon hotels – all our hotels have the famous Maldives Water Villas on stilts. Coco Palm Bodu Hithi – Just 45 mins from Male by speedboat with 100 villas. 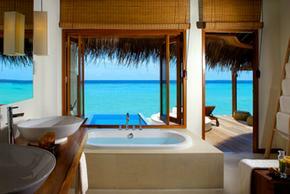 Great for choice of water villas with private plunge pools and beach villas to suit all budgets. Find a stylish boutique hotel in the Maldives from the Hotique guide to luxury hotels in the Maldives.